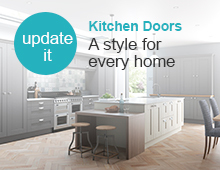 The future is bright; the future is tidy with Clutterfree kitchens! In Britain we live in the smallest spaces per square foot of any other country in the modern world. Our homes are “cosy” and “compact” as many of us trade space for convenience. However, no matter how large your home, whether it’s a one bedroomed apartment or a sprawling manor house, storage will always be a problem. 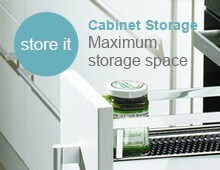 People assume a very large kitchen never has a problem with storage, however the opposite may be true. Although there may be plenty of space to hide gadgets and paraphernalia, the items are rarely kept close to hand. This year, clutter free innovative design is leading the way for home cooks and those who adore the convenience of being able to find what they need in a second. Last year we saw the return of the vintage eras from Seventies chic to Fifties teak; everyone became a connoisseur of retro as they upcycled their parent’s furniture and sought authentic glass and art from reclamation yards. This year we see the return of the Barberella design, long sleek clutter free counters, futuristic smooth pristine walls and everything hidden but just within reach. We’re finally stepping into the future that was predicted half a century ago and we love the innovative designs that inventors are creating to allow us to make the most of our cosy homes. 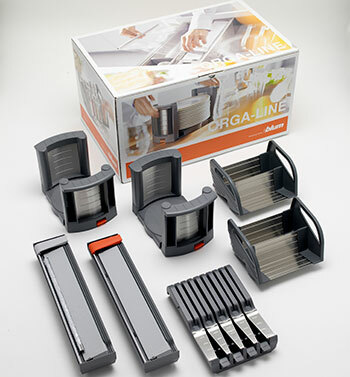 With secure solutions that keep plates stacked firmly and neatly and cutlery ordered and regimented, the Orga-line range reduces chipping of your favourite crockery and scratching of your favourite knives and forks. You will no longer hear a clatter as you pull open drawers or have to empty a cupboard before you find the plates you need. 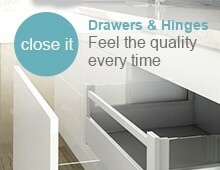 With Blum and Orga-line, every item is considered and taken care of. 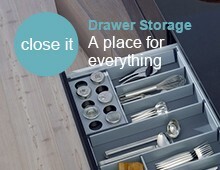 Blum has quite literally thought of everything from space for your spices to holders for sharp knivesthat cleverly fit within utensil dividers. They’ve even considered the amateur baker; followng on from the popularity of the “Great British Bake Off”, they’ve designed a solution that allows baking utensils and trays to be stored easily. 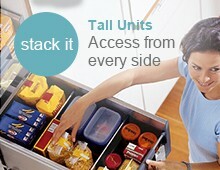 No more rattling trays and no marks on your kitchen cupboards and drawers. The starter pack is the ideal place to begin. In just one handy box, you receive plate and knife holders, Cling film and foil holders, and even spice storage. 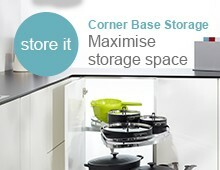 Ensuring you benefit from a clutter free kitchen in an instant has never been easier.